This chess board has made from best quality of Teak wood and carved by expert cratsman. Its carving so beautiful and unique. This handmade product has sophisticated and clean look. It is covered by acrylic paint and clear acrylic lacquer. To tidy it up, you can fold it, so easily stored or carried away. As usual chess board, our chess board has 32 brown squares and 32 black squares so amount 64 squares. You just lay it on a table and put the chess pieces on it. Not only that, you can also use it outdoor and indoor. Very durable product, simple and carved. You can use it where ever you want. 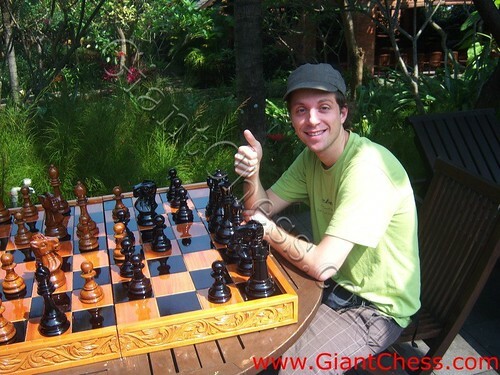 When you having recreation and plan to play chess game, you can carry this chess board, complete with its chess pieces. Get it now!